Small-batch Peach Oolong Butter - Get the Good Stuff! This preserve with subtle notes of oolong tea is excellent with toast or scones.The only word that properly describes it is a 'butter' - this jam has the mouthfeel of apple butter, smooth and delicious. Small-batch peach oolong butter goes together quickly, makes just a few jars. This small-batch peach oolong butter with subtle notes of a good oolong tea is excellent with toast or scones. I wanted to capture the taste of with a thicker texture. This one’s a winner! The only word that properly describes it is a ‘butter’ – this jam has the mouthfeel of apple butter, smooth and delicious. While a true fruit butter is a sweet spread made of fruit which has been cooked to a paste, in this instance, I take a different path. I use sugar to draw juice from the peaches, add tea, cook the resulting mixture, and then puree it all with an immersion blender. Like all small batches, this goes together quickly. A note: peaches with slight bruising are okay to use, but cut out any dark brown bits. Rinse the peaches well, but don’t bother peeling them. Pit them, and cut them into small pieces, and put them in a large heavy-bottomed pot. (I used my favorite 4 qt pot, which was perfect for the task.) Add the sugar and lemon juice, then stir well, cover with a clean tea towel, and let stand 1 to 2 hours to bring the juice out of the peaches. Put 4 8-oz jars in a pot, cover them with water, and bring the pot to a boil. Boil the jars for 10 minutes, then turn off the heat, cover the pot, and let the jars stand. Wash the lids in warm water and set aside (see new procedures for jar lids!) Have the bands handy. Put a saucer or small plate in your refrigerator to chill (this will be for testing doneness.) Have an extra small jar, or custard cup, clean and ready for any excess. When you’re ready for the cooking – you’ll need 45 – 60 minutes, no more – add the tea bags and a tiny pat of butter, then bring to a boil. Reduce the heat to low, then simmer the mixture until the fruit is translucent and cooked through. The smaller the pieces are, the faster this goes. When the fruit is all soft and tender, remove the pot from the heat, remove the tea bags, then whiz the fruit mixture with an immersion blender to make a smooth purée. Return the pot to the heat, and bring it back to a boil. Stir often, because the jam is easy to burn if the heat is too high. Cook until the jam thickens and will pass the wrinkle test – this will go surprisingly quickly. Ladle jam into prepared jars, wipe rims, and apply lids and bands. Anything that won’t fit in your four jars can go into the clean custard cup – chill it in the fridge, this is perfect with yogurt or on toast for breakfast! Process the jars in a boiling water bath 10 minutes. So much jam! - Get the Good Stuff! I am an experienced jam/butters/preserves etc. maker and sell my products at our local harvest store. The name of my product line is called, “Reach for the Jars”. I make my products when I can pick the fruit or at least get it in season so I can control the quality.I have an opportunity to make a large number of jams for our local hospital’s employee gift baskets for the holidays. I would like to make a jam flavored with tea to submit for tasting. It’s a black tea called Comfort and Joy, made by The Republic of Tea. with cinnamon,cloves,licorice root, Apple pieces, and “natural favors”(whatever those are…?!) 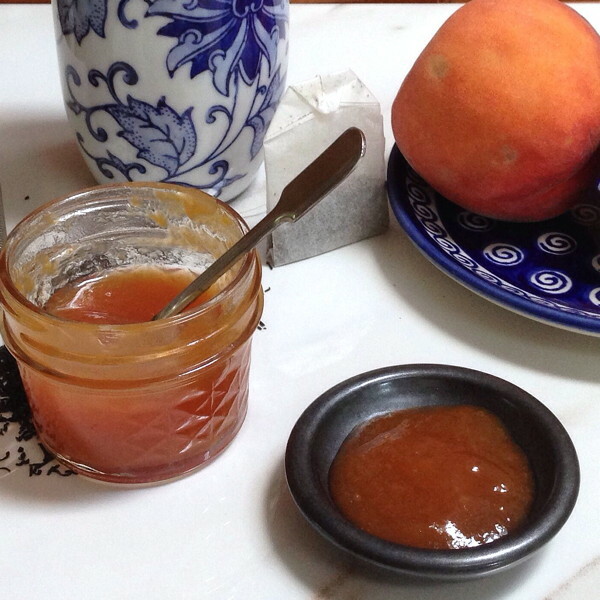 I use A low sugar pectin; Pomona’s, so the product is more fruit than sugar, in small batches like your Peach Butter Oolong recipe. My recipes usually require about 4 cups fruit to maximum of 2 c sugar. I think I would like to leave the tea leaves in the jam for visual interest. I am already going to submit an apple/cranberry jam w/ orange zestfor tasting, so I’m not sure I want to submit a second apple based jam unless I can make it taste quite different. I guess this is the “verrry” long way around to ask you how much tea would you suggest per batch? Can you suggest another seasonal fruit for the base of the jam besides Apple? (I think pears would be too pricy). Thank you for your time. First off – great questions! I haven’t used that particular tea blend, so I have no idea how quickly it brews, nor how it changes with extra time. You will have to try different batches to see what works best – there’s no real substitute for trial and error. I would start with 2 bags for 4 cups fruit, and see how it goes. You may not want to leave the entire contents of the tea bag in the preserve – I’d think that pieces of licorice root or a hard clove would be annoying. Here in Michigan, it’s pear season, so the price of fresh pears is actually as low as, or even lower than, the price of apples. Pears would also form a subtle base for the preserve, and not get in the way of the tea/spice taste; that would certainly be my own choice. I would love to hear how this turns out!